I loved shopping the Belk Valentine's gift guide for my fix on all things pretty & sparkly, but ultimately decided to treat myself with a little V-day boot action. I can't help it, I adore the classics! Thank you to Belk for sponsoring this post & giveaway. And a big thank YOU for supporting the brands/businesses that make this blog possible! P.S. 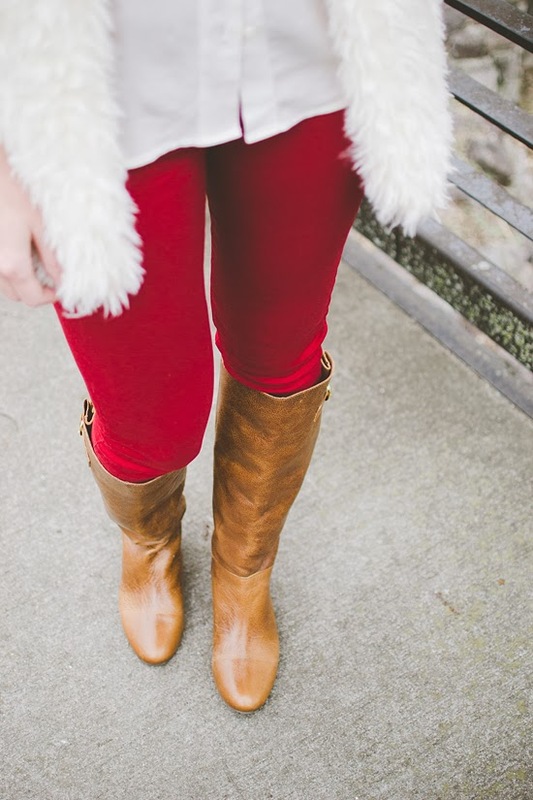 Linking up with the Thursday Takeover: WInter Boots. no plans yet, but probably something low key like a cooked dinner in! No plans yet, I'm always such a procrastinator! My church is having a formal dinner (theme is Paris with a french menu). My husband agreed to come with me. I'll be helping to get dinner ready. I'm excited for him to finally meet my church family. Babysitting, so a sweet couple I know can have a much needed date night. dinner and a movie at home :) cant wait! Okay I actually sorta stole my Valentine's Day plans from you! My fiance and I are going to go wedding band shopping on V-day since we knew we didn't want to spend $$ on other gifts while we were saving up for the wedding. When I read what you had planned to do, I thought it was such a great idea! My husband and I like to cook a meal together, sip some wine, do a little dancing to a bossa nova beat, then snuggle on the couch while watching an old movie...it's HEAVEN! I plan to relax at home with my husband and our two Labrador Retrievers. No plans yet. I'll probably watch a movie at home with my husband. love the red pants! and as far as valentine's day, my very single self plans on just buying a bottle of prosecco, having dinner, and dessert...and probably watching a movie. I will be my own valentine! A relaxing dinner at home with my bf...and chocolate! Making dinner for my husband! And he's promised me a spa day! I will be just coming home from a week long business trip so we will have a quiet evening at home. The color on these is perfect...especially for Valentine's day! LOVE this outfit! I'm going to get my hair cut and colored on Valentine's day, then Jarrod and I are going out for dinner at Firebirds the next night. I have zero plans yet. I take that back, I have a test that day so I'm probably going to be locked into the library! I plan on making treats for my kids, and having a nice quiet evening with my hubby. Thank you for the fabulous giveaway! My boyfriend and I will be watching Season 2 of House of Cards, since the whole season comes out at once on Valentine's Day! We love that show and have been waiting for more! I'm planning on taking my 3 girls to eat dinner on Sunday, February 16th nothing too fancy just a gold ol time at yummy Chili's. im not sure yet but i hope its something good! My husband and I make a fancy dinner at home and enjoy it by candle light. We learned when we were dating that trying to go out to a restaurant on Valentine's Day was not worth the hassle to get reservations, wait to be seated and noise of a crowded restaurant. It's more romantic without all of that! A nice dinner with my bf! I have family coming down to go to the local Wildlive expo....may not be a normal Valentines day evening, but it is with all my favorite people. No plans yet, but I did just order Hunter some protein powder, can you say romance?! I am investing in new brown boots asap. I have my heart set on some Frye's, but I have to ask: do the Intyce boots live up to the hype? They are pretty much a perfect shape/color. my boyfriend will be in baltimore :( So i don't have any yet! Unfortunately I have to work all overnights that weekend so we are going out this Saturday to a little bistro then cuddling with some movies! Probs just going to dinner with my husband! Most likely making dinner and dessert together. I'm not sure what we are doing. Probably just going to Taco Bell without the girls. We have dinner plans and I'm trying to sneak in a cutesy movie too! We'll spend the day with our kids. Family love! As of yet, no plans. My husband and I plan to make dinner together and just enjoy a relaxing evening together, a very rare treat. My husband's birthday is in Valentine's day! We'll probably go out on a different night and cook a fancy dinner at home on the 14th. My valentines day plans include a day trip to the aquarium with the cutest guy in the world. Looking forward to it. I have those same Steve Madden boots, and they are my go-to boots for pretty much any outfit. Love them! i'll be spending it with my best friends! I go out to dinner at the same restaurant we've gone to for the last seven years. No plans yet but looking forward to the day! Those jeans fit you perfectly! Love the color! My husband and I are leaving that day for vacation to San Diego!!!!! Whoop!!! No big Valentine's day plans - headed up to see my family in Boston! I'm going out to dinner with my boyfriend. No idea. I did buy an adorable outfit though! Love your outfit, btw, especially the necklace and fur vest. It's a great take on red for Valentine's Day! My husband and I are going out to dinner and a musical without the kiddos! I'm gonna skype my man and eat lots of heart shaped cookies! My Valentine's Day plans are to ignore it! The red on those jeggings are amazing Jess! I think we might just chill with a new movie from netflix, dim sum takeout and something chocolatey. This year I do not have plans for valentines day as of now. I will get my daughters gifts to them and that's all I have planned. So far, no plans for Valentine's day. Listen to the Jack Benny Program (old radio show from the 30s-50s), because Valentine's Day is his birthday! We're going to stay on and eat takeout by candlelight! No plans as of yet. Maybe stay up with my husband after the kids go to sleep & watch a movie. Hanging out with lots of friends and the husband! love this look! I'm hoping my fiance takes me to a concert of an artist we both love! No definite plans yet. My mister usually surprises me. Not sure yet, but hoping to spend some time with my hubby - I don't really care what we do! I am excited to get a couples massage with my boo. Since it's a Friday I will most likely order out with the family and watch a movie, the restaurants might be a bit too crowded. my boyfriend's taking me out to a nice dinner and don't tell him (:P) but I'm getting us a couples massage! Just a quiet dinner (thanks to Groupon...keeping it cheap!) with my boyfriend! I have no plans to-date. I sometimes just like to wing it and see where i end up. We're going out for a nice dinner. going home with my boyfriend to spend the weekend with his family! Love that is can easily be an everyday outfit too! I am having dinner with my family on V day! It's looking like a GALentine's Day for me! I am going to Skype with my hubby. He is in Biloxi , MS doing his tech school. Spend time with my hubby. No set in stone plans just yet. Love those boots! Just picked up a pair myself. This valentines day I plan on spending it with my best friend! We're having a much needed girl's day!! A nice, quiet dinner in with some wine or champagne. We're heading into the city for a night away! I dont have any plans for Vday. We are having a filet mignon and crab leg dinner at home. That's about it. I am going out to dinner with my GF. I have no plans. How sad is that? Cooking dinner with my boys! We are staying in a cooking! I'm flying to OKC to see my best friend and her hubby for the weekend! Woohoo!! 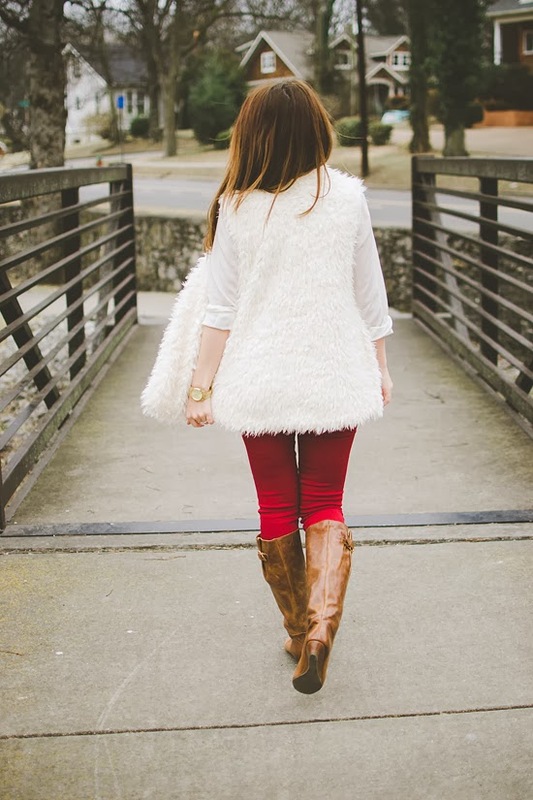 Love your red skinnies. No plans so far other than to watch a lot of movies. I think my husband and I are going to make risotta and seared scallops and have a lovely night in! Merlot or moscato by the fireplace, jazz, and a home-made dinner of something delicious and unusual! I absolutely love the color of these pants! My husband says he has a little surprise for me, but I can't let him have ALL the fun! So we are going to make homemade heart-shaped pizzas at home. I don't know yet, my husband always plans it and surprises me! last year he made a tent in our living room out of a sheet and chairs and we made homemade pizzas and hung out "camping"! hanging out with my girls - galentines day! I have no plans for Valentine's Day.